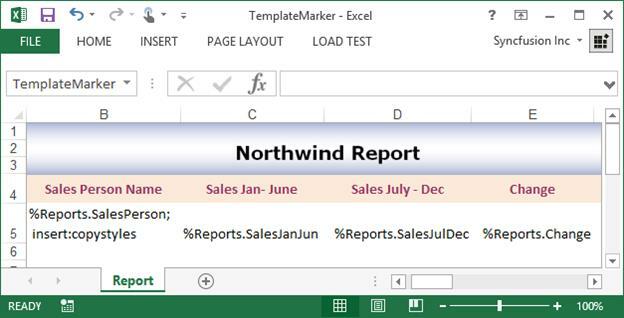 You can change the marker prefix and delimiter characters by the MarkerPrefix and ArgumentSeparator properties of the ITemplateMarkersProcessor instance respectively. You can specify the following arguments with the marker to customize the worksheet. Horizontal-This argument specifies the horizontal direction of the data filling for variables. insert-This argument inserts new row or column, depending on the direction argument for each new cell. 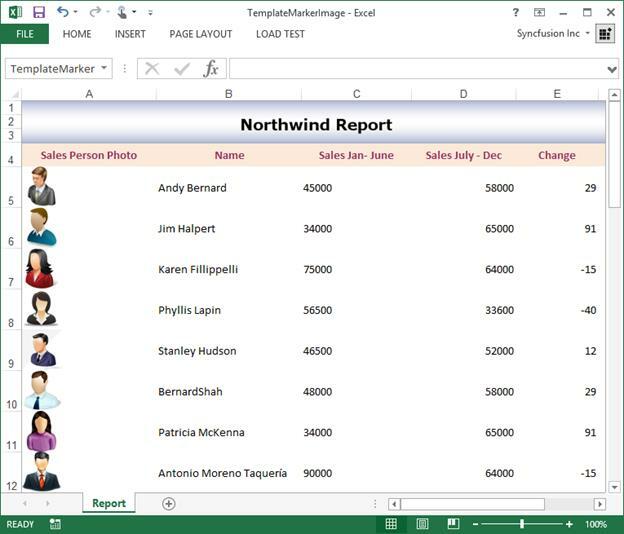 Note that by default, the rows will not be inserted. insert:copystyles-This argument copies styles from the above row or left column. jump:[cell reference in R1C1 notation]-This argument binds the data to the cell at the specified reference. Cell reference addresses can be relative or absolute. copyrange:[top-left cell reference in R1C1]:[bottom-right cell reference in R1C1]-Copies the specified cells after each cell import. 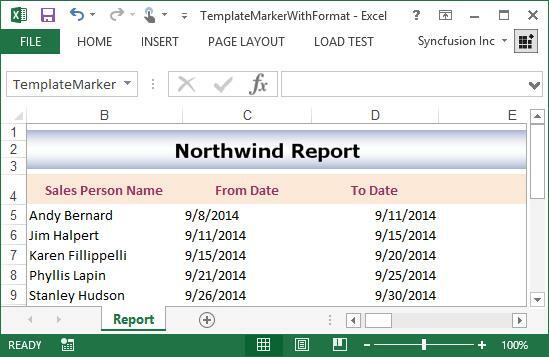 An array of data can be binded to the marker in the template document. The following screenshot represents the input template which has a template marker. 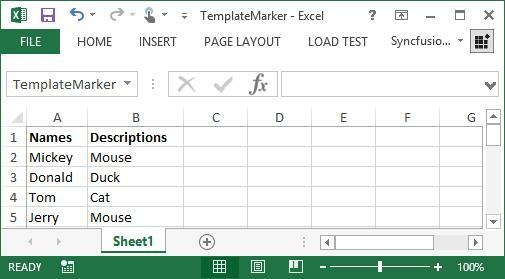 Following code example illustrates how to bind the data from an array to a marker. 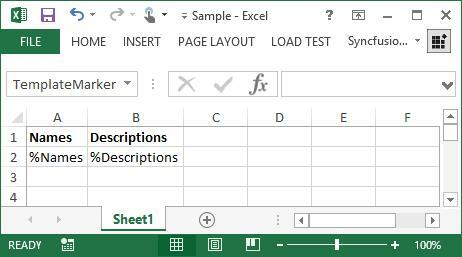 The following screenshot represents generated Excel file in which the array of data is bounded. You can also add or insert template markers using XlsIO APIs as follows. 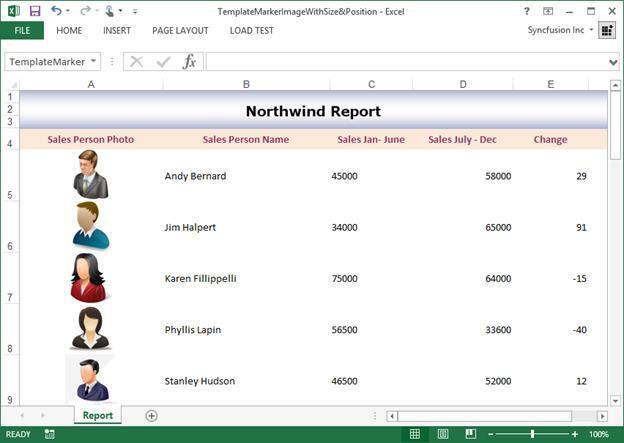 By default, DataTable values will be filled in the worksheet as a string format. You can detect data type and number format of DataTable values by using VariableTypeAction enumerator. To know more about the VariableTypeAction enumerator, please refer VariableTypeAction in API section. The following code snippet illustrates how to detect data type and apply number format with template marker. //XlsIO supports binding data from data table using template markers in Windows Forms, WPF, ASP.NET, ASP.NET MVC, and ASP.NET Core (2.0 onwards) platforms alone. 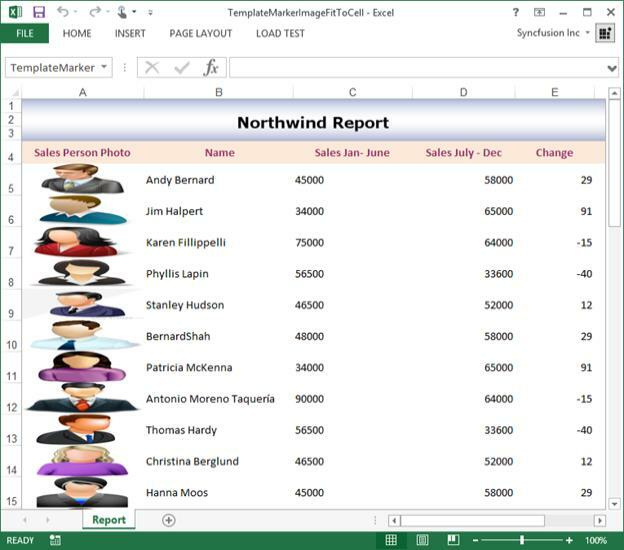 The following screenshot represents an Excel file in which the data type is detected and then number format is applied. XlsIO detects the property as image when its type is System.Drawing.Image or byte . The image can be formatted using the following arguments. Image is applied with a default size (50x50 pixels) and position (Top-Left). The image is applied to cell width and height. Image is applied to the specified size (width, height). Height parameter is optional. Value of width is applied when height is not specified. Image is positioned (top-left, top-center, etc.,) within the cell. In the following example, a marker is added for merging images. Data source and property name is specified (%Reports.Image;) for image also. Image can be used in array, DataTable, and CLR objects. Different positions of the image are maintained internally in the ImageVerticalPosition and ImageHorizontalPosition enumerators. To learn more about this, refer to the ImageVerticalPosition and ImageHorizontalPosition enumerators respectively in API section. The output of all the image insertion options with input templates are as follows. 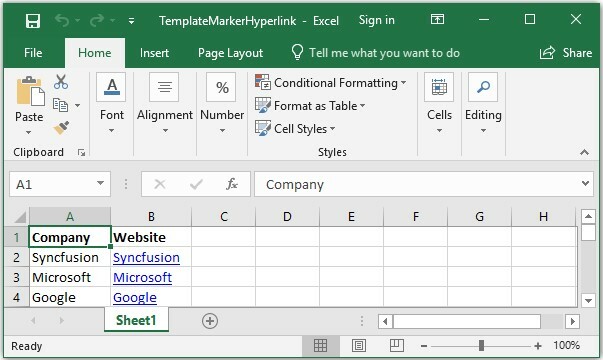 You can also refer to the Template based data filling using Template Markers section in Getting Started for the sample regarding template marker with images. 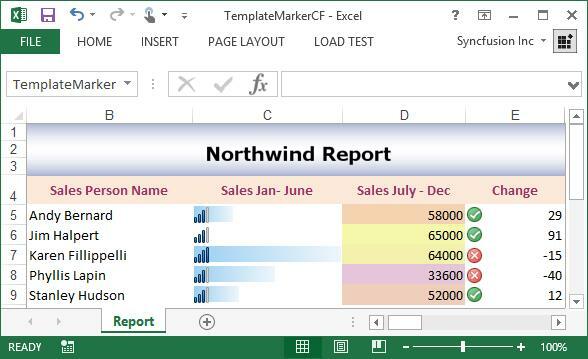 You can create or apply conditional format to the template marker range. The following screenshot represents the input template, which has a template marker. 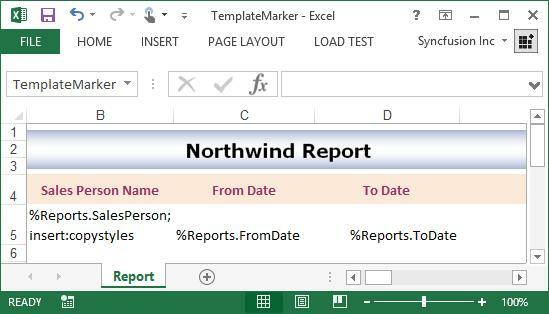 The following code sample illustrates how to create or apply conditional format to the marker. The following code snippet provides supporting method and class for the previous code. 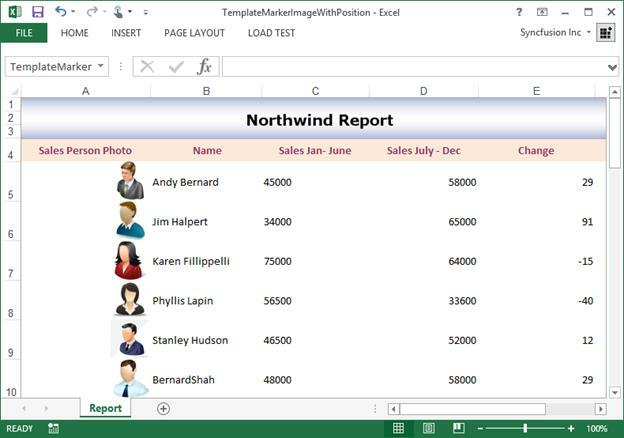 The following screenshot represents generated Excel file in which the conditional format is applied. 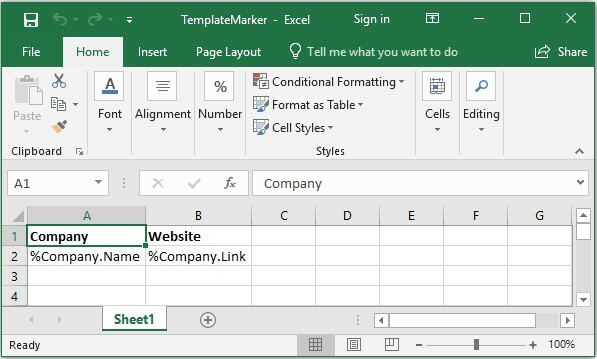 You can add hyperlink to the template marker range. The following code snippet provides supporting methods and classes for the previous code. 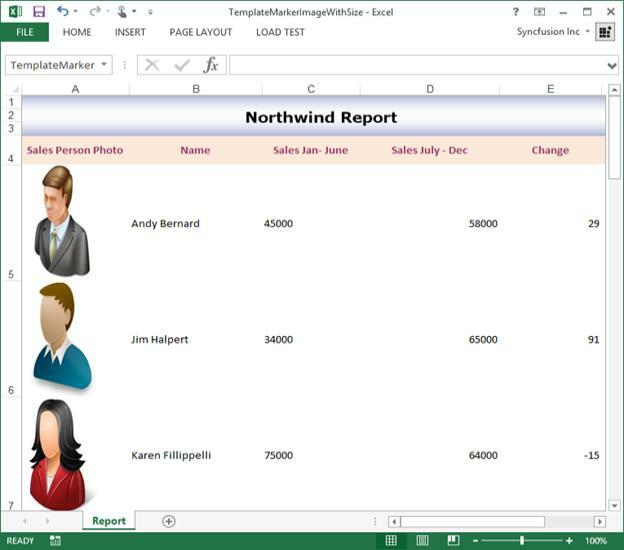 The following screenshot represents generated Excel file in which the hyperlink is added.